What is the Leading Cause of Medication Management Issues? 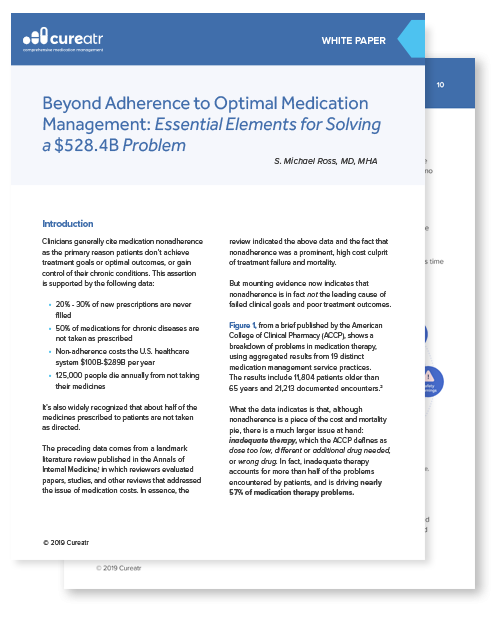 Many clinicians cite medication non-adherence as the main reason that patients aren’t achieving treatment goals, optimal outcomes, or gaining control of chronic conditions – but that is only a piece of a larger puzzle. While adherence is one part of the problem, the bigger issue is inadequate therapy. Knowing this, one step clinicians must take is shifting their mindset from the current belief that patient non-adherence is the main issue to the new mindset of optimal medication management. Discover the importance of each of these elements in improving medication management.